This amphetamine-like substance causes the same types of effects on the body as other forms of speed—loss of appetite, insomnia, increased heart rate. The abuse of this drug in larger doses, especially through injection or snorting, puts an even greater strain on the body. The stress on the heart can be fatal. Take the case of a teenager—a long-term user of Ritalin—who collapsed one day while skateboarding. Dead of a heart attack. An injection of Ritalin has an additional, horrible effect on the body. While the chemical compound methylphenidate dissolves completely in water, the tablets also contain tiny particles of insoluble fillers. These solid materials block the small blood vessels when injected into the blood stream, causing serious damage to the lungs and to the eyes. Aside from the physical impact, there are also severe emotional conditions caused by even short-term use of this drug. Hallucinations and psychotic behaviour are not uncommon. 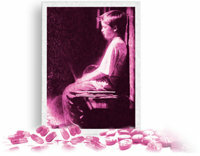 A researcher in Texas found that Ritalin use may heighten the danger of cancer. This study found every one of a dozen children treated with methylphenidate experienced genetic abnormalities associated with an increased risk of cancer.